THE VIP KEY THAT UNLOCKS 3 CITIES. 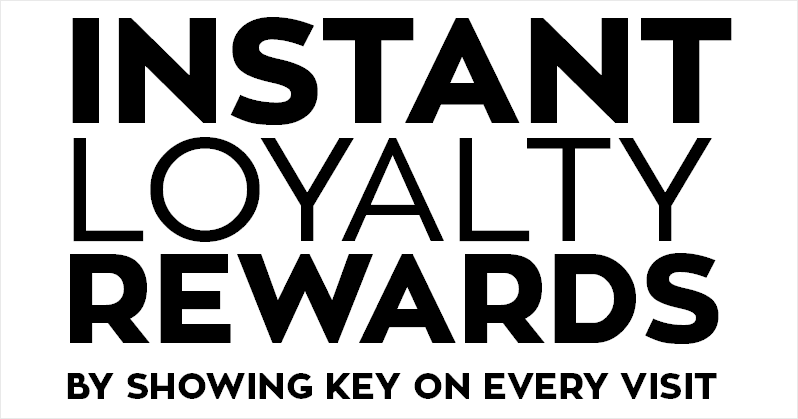 Whenever you visit their business, you simply show the Key, tap it and enjoy your exclusive instant loyalty VIP perk every time. No miles or points – but rather instant loyalty love on every visit all year. As you can see, the value is immense as our VIP perks are valued from $15-$55 each visit. With 225+ total program partner restaurants / nightlife / spas / entertainment and more currently, Keyholders enjoy variety and the VIP lifestyle that comes with their Key. Keyholders also enjoy exclusive advance ticket savings at The ROM, Second City, CNE, Ripley’s Aquarium, Cirque Du Soleil shows, Hockey Hall Of Fame, Cider Festival, Toronto FC, Toronto Raptors (select games), Toronto Marlies, Raptors 905 and more. WHAT’S THE VIP TORONTO KEY REALLY WORTH TO ME? Aside from the awesome factor of having a Toronto Key To The City, there’s access to over $4,500+ in VIP benefits that await you with the Key. Average redemption value for Keyholders is around $400+ per year based on surveys. And that’s just local VIP benefits; Now that the Toronto Key unlocks all VIP benefits in Vancouver and Montreal when traveling, we expect that value to increase exponentially. Feel like a King (or Queen) whenever you show your VIP Toronto Key and enjoy complimentary thank-you appetizers, drinks, off-the-menu items, spa upgrades, club access, BOGO exclusives, access savings to all Plaza Premium Lounges across the country and so much more. Get your Key today! 92% of Keyholders will renew and get a new Key, year-over-year. That says something about the value of the Toronto Key! We’ve continued to partner with only the best local restaurants, nightlife, entertainment venues, shops and services who want to give back to our key-holder members – and for nothing more than your loyalty. We keep adding more locations throughout the GTA every month so the Key just gets better and better. No coupons to clip; No miles or points to collect; No vouchers to download. Just show your Toronto Key To The City and enjoy unlimited instant loyalty perks right away – across 3 cities including Toronto, Vancouver and now Montreal. And this awesome key is good until December 31, 2019! PS. Perks are unlimited so you can return often whenever doing business at any of our partners and enjoy the VIP Keyholder perk over and over again all year. Or find new experiences as we unlock only the city’s best restaurants, spas and more! WE’RE A COUPLE AND NOT SURE IF WE SHOULD GET 1 OR 2 KEYS? We find people want their own Key as the perks are great and it looks beautiful on your keychain so it’s unlikely you will want to share it. However, one Key is enough depending on what you want to use the Key for. Most VIP perks, for restaurants and spas, are for the Keyholder-only. However, nightlife VIP perks usually include a plus 1 guest and event/entertainment ticket partners give you savings on ALL tickets bought in-advance as a Keyholder. But again, you will like the allure of the Key on your keychain and that it’s a conversation starter! There is an extra added benefit to having 2 Keys; 1 Key is $99 per year and 2 Keys is $149 per year so you save $49 having two. ARE THERE GOING TO BE MORE BUSINESSES ADDED? Absolutely. We curate everything to match our demographic of Keyholders and what people want. We also present new finds and hidden gems that we know Keyholders will love. We continue to source and add the best of the city, and Montreal + Vancouver, and add new Perk Partner businesses monthly so your Key just gets better! 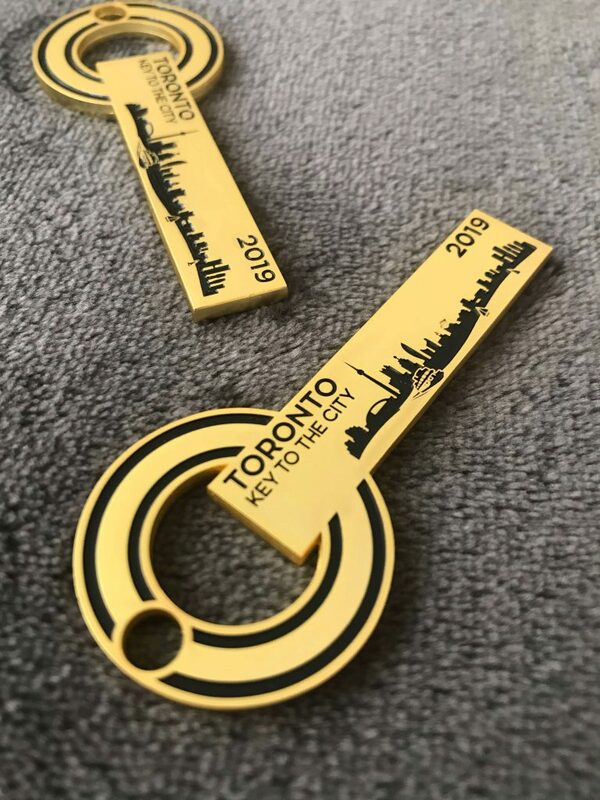 We also listen to feedback from our Keyholders so if there is a place in your neighbourhood or something you think should be added, send us an email at info@torontocitykey.com! There’s a reason over 92% of our Keyholders renew their subscriptions for a new Key year-over-year! Our Keyholders love the ongoing VIP benefits, as a subscriber, across Toronto and now 2 more cities with our openings in Vancouver and Montreal. Each month, we add more of the best partners and VIP benefits to the Key program. And every year, we also expand to include more cities which gives Toronto Keyholders even more reach for VIP benefits whenever traveling. As a subscriber, you keep your annual rate that you paid, grandfathered annually for life. That means, the new Key for 2020 and beyond would be renewed annually for the same rate you paid for the 2019 Key. The rate will never increase, no matter how many more partners and VIP benefits or how many cities we add for you to enjoy as a Keyholder subscriber. You can also cancel at anytime by messaging our Live Chat 24/7 or email or logging in to your account. 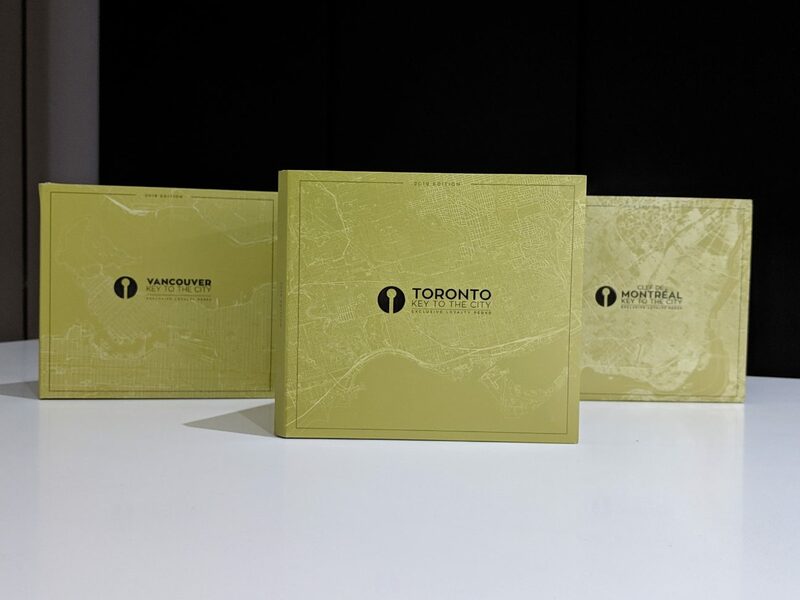 If you wish to just order the Toronto Key for one year only (for gifting or any reason), and don’t wish to be a subscriber with a locked-in rate for life until cancelled, you just need to let our Live Chat representative know and we will ensure it is a one-time order. But we are pretty sure you will want to renew when you enjoy the VIP benefits and special rate you keep despite planned increases in price for new Keyholders next year. DO YOU HAVE AN APP TO HELP NAVIGATE THE VIP PERKS? Absolutely! The Key always has to be shown (which you will love doing) but we do have a mobile app that is useful after you purchase your Key as it provides a guide to all perk locations and will alert you whenever you near participating partners businesses – with a reminder! 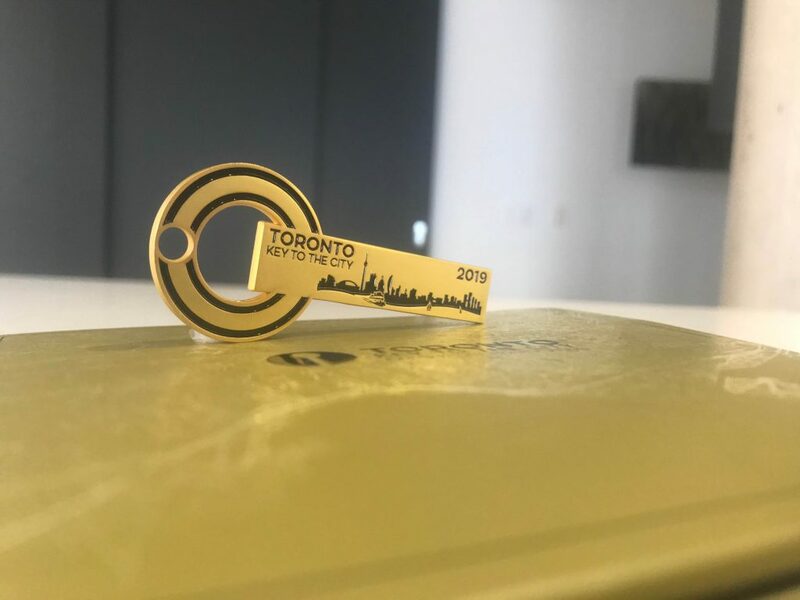 The 2019 limited-numbered Toronto Key unlocks the very best of Toronto, Vancouver and Montreal. DO YOU OFFER GROUP KEY OPTIONS FOR OUR OFFICE OR EVENTS? We do. We have special pricing for small to large groups or events and conferences. Our Keys make a great gift for clients / event guests or employee benefit or unique welcome to the city for conferences. To inquire about group rates, email us at info@torontocitykey.com. WHERE DO I SEE ALL THE VIP PERKS THAT COME WITH THE KEY? You can view all 225+ VIP perk partner locations that reward Keyholders in 2019 – and even more to come every month – on our website here or our mobile app by searching for “Toronto Key” in the App Store on Google Play or iOS. View all 225+ VIP Perks and Partners your Toronto Key unlocks across 3 cities including Toronto, Montreal and Vancouver – click here.